Avaaz - Spain: stop the dog torture! Spain: stop the dog torture! 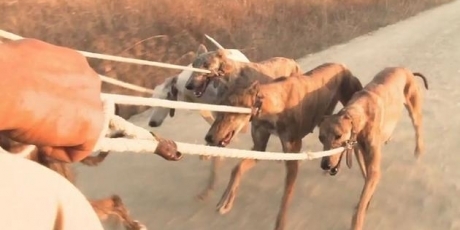 We urge you to end the cruel practice of dog hunting! Spain is the only country in the EU that still allows the suffering of thousands of dogs in this way every year -- it's time to end it. Every year in Spain, thousands of greyhound dogs are beaten, burned, and tortured to death after being used just a few times for hunting. Many of the pups die from the “piano dance” where they are hung from their necks and their paws barely touch the ground. Research shows dogs’ brains are similar to ours when it comes to emotions, and for many of us, they’re like family. It’s sickening and crazy that this is happening, but momentum is building, and a huge outcry from the public can help stop it. Spain is the only country in the EU that still allows dog hunting, and now EU MEPs are starting to speak out. Most people in Spain are turning against these kinds of animal cruelty practices, so if we join them and the ministers with a massive call, we can save tens of thousands of pups from unimaginable pain. When one million have joined, Avaaz will pull out all the stops with hard-hitting ads, work with celebrities to amp up the pressure, and hold high-level meetings until we see real action that protects these poor dogs.